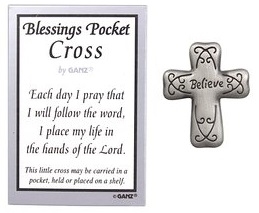 BLESSINGS POCKET TOKEN (BELIEVE) BY GANZ. This token measures 1" X 3/4". It is a metal cross with the word "Believe" on one side and a cross on the other. Cross also has an etched design on both sides. Great to carry in your pocket, purse, or leave on your desk at work. Perfect anytime gift!